Increasing awareness regarding the protection of skin is resulting in the rising demand for after sun products. Along with this, the demand for sun care products with other skin care benefits is also increasing. Hence, manufacturers are moving towards developing innovative products with multifunctional benefits. In the recent years, the natural and organic skin care products have also witnessed tremendous growth. After-sun products market is highly dynamic and competitive as consumers are expecting effectiveness, safety and convenience. Hence, there is an increasing focus on providing skin care products with long-lasting and full protection along with moisturization. After-sun products are also being produced with natural ingredients such as almond oil, vitamin E, shea butter, aloe vera, in order to boost skin moisture level along with reducing inflamed, sore patches and skin tanning. 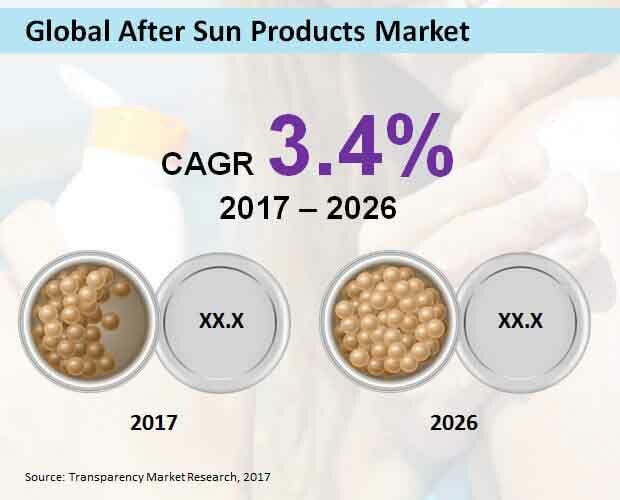 As per the report compiled by Transparency Market Research (TMR), the global market for after-sun products is likely to witness slow growth, registering 3.4% CAGR between the forecast period from 2017 to 2026. The global market for after-sun products is also projected to bring in US$ 2,928.7 million revenue by 2026 end. Among various types of after-sun products, creams and lotion are likely to emerge as the top-selling after-sun products. Towards the end of 2026, creams and lotion are projected to bring in close to US$ 1,800 million revenue. Increasing number of people prefer to use after-sun cream and after-sun moisturizing lotion. Creams and lotions with soak quickly and easy to apply are gaining a lot of attraction. Moreover, easy to carry and apply anytime and anywhere factors are also fueling the demand for creams and lotion. As compared to males, females are likely to emerge as one of the largest users of after-sun products. Females as the users of after-sun products are projected to surpass US$ 2,200 million revenue towards 2026 end. After-sun products and antioxidants are the two most important components of women’s skin care regime. Moreover, the skin problems including wrinkles and premature aging is growing at a fast phase among women. Hence, these all factors are driving the demand for after-sun products by females. Modern trade is likely to emerge as the largest sales channel for after-sun products. By 2026 end, modern trade is estimated to surpass US$ 1,200 million revenue. With increasing number of hypermarkets and supermarkets, prominent players are planning strategies to maximize returns from modern trade channels. Special retail packages, in-store promotion are some of the steps taken by companies to increase sales through modern trade channel. Compared to the natural and organic sources, conventional sources are likely to be used on a large scale in the production of after-sun products. Conventional source to reach close to US$ 2,000 million revenue by 2026 end. Although natural and organic ingredients are gaining popularity, conventional sources are still being used largely in the production of after-sun products. As the chemicals used in after-sun products are more effective against various skin problems. Moreover, the medicated after-skin products offer fast relief from sun burn, skin irritation, etc. Europe is likely to emerge as the largest region in the global market for after-sun products between 2017 and 2026. Meanwhile, North America followed by Latin America are also anticipated to witness growth in the market due to the drastic weather conditions and increasing number of people suffering from skin tanning and other skin problems. Beiersdorf Aktiengesellschaft, L'Oréal S.A., Johnson & Johnson Services, Inc., Kao Corporation, Avon Products, Inc., Shiseido Co., Ltd, The Estee Lauder Companies Inc., The Procter & Gamble Company, Christian Dior SE, and Unilever PLC, are some of the major companies in the global market for after-sun products. Exposure to the Ultraviolet (UV) rays can harm skin resulting in tanning, premature aging of the skin, and other skin problems. In the worst case, it can also lead to the skin cancer. Hence, to avoid all these problems, the use of after sun products is constantly increasing. After sun products with various SPF levels are gaining traction in the market. Owing to the increasing demand, the manufacturers of after sun products are focusing on introducing multi-functional products such as skin care products with anti-wrinkles and whitening properties. With the increasing interest towards using natural products after sun product manufacturers have also started including natural ingredients in their products such as fruit extracts, aloe vera, etc. skin care product manufacturers are including various features such as oil-free, quick absorption, water resistant, light formulation, etc. Key players are also focusing on developing organic skin care products that can provide safety from UV rays. The report is created by using a top-down approach and bottom-up approach to offer estimation on the growth of the global after sun products market. The report also offers key insights after sun products market segments and key regions. Market dynamics including driving factors, key market trends, major market opportunities, and challenges are also given in the report. The report is based on the primary research and secondary research to give a clear picture of the market and to provide in-depth analysis on the key factors in the after-sun products market. As the part of primary research interviews were conducted with market experts and the opinions offered by the respondents were verified with valid data sources. Meanwhile, secondary research included investors’ presentation, financial reports and annual reports of the key market players. The report also includes market attractiveness analysis, analysis based on Porter’s five force model, and (Strength, Weakness, Opportunity and Threat) SWOT analysis to help the manufacturers in identifying opportunities in the market. The report offers Impact analysis based on various driving factors. Estimated revenue, market share, year over year growth, and CAGR in percent form is provided in the report. Incremental opportunity in the report proves to be the vital factor in identifying various market opportunities. The report offers profiles of the key players in the global after-sun products market. The key companies are evaluated on several parameters such as financial overview, key business strategies, new product launches by the companies, company overview, product portfolio, and key developments in the market. This information can help in planning business strategies and compete in the global after-sun products market. The global after-sun products market is segmented into product type, end user, sales channel, source, and region. The product type is further segmented into creams and lotion, cleansers and foaming, essential oils, gel & scrubs, and other products. Based on the end users, the market is segmented into male and female. On the basis of sales channel, the segmentation includes modern trade, convenience store, departmental store, drug store, online stores, and other sales channel. Source is further segmented into conventional, natural and organic. Region-wise the global after-sun products market is divided into Latin America, Europe, Japan, Asia Pacific Excluding Japan (APEJ), North America, and the Middle East and Africa (MEA). The key market players operating in the global after-sun products market are L'Oréal S.A., Beiersdorf Aktiengesellschaft, Johnson & Johnson Services, Inc., Avon Products, Inc., Kao Corporation, Shiseido Co. Ltd, The Procter & Gamble Company, The Estee Lauder Companies Inc., Unilever PLC, and Christian Dior SE.